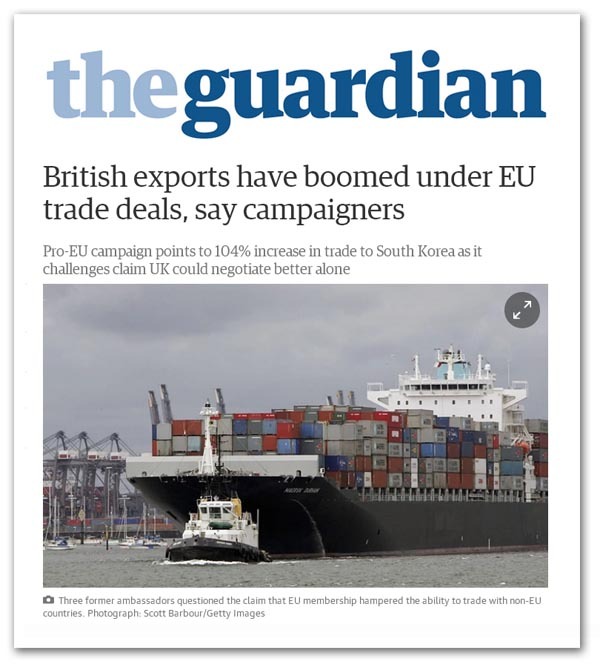 The BSE campaign is warming up for another of its propaganda-fests, this one on trade, with a pre-publication hit offered to the Guardian. At the centre of this fest is a report written by three former UK ambassadors to the EU, in which they argue that British exporters would be disadvantaged if the UK left the union. They claim that Britain would immediately lose access to free trade deals with 51 states and would then have to renegotiate its own bilateral deals as a weaker force – "a country with a population of 63 million rather than as a member of a union with a population of 500 million. Potentially, this might seem a major problem. Currently the European Union lists 853 bilateral treaties on its treaty database, together with 258 multilateral agreements. Of those 1,111, 250 are classified as trade agreements. These cover a vast range of subjects from the "Agreement between the European Union and the Republic of Moldova on the protection of geographical indications of agricultural products and foodstuffs" to the "Agreement on fishing between the European Community and the Kingdom of Norway". However, as always, dishonesty stalks the land. If others made the claims such as we are hearing, they might simply be considered disingenuous, but these people are former ambassadors. And, as diplomats, they must be familiar with international law. In that specific context, we are dealing with the problem of continuity of treaties (which is what free trade deals are) following a change of status of the contracting parties. But this is a problem that has been met before. In more recent times, there was the "velvet divorce" between the Czech Republic and Slovakia, which created precisely that problem. But it was resolved when on 19 January 1993 the two republics were admitted to the UN as new and separate states. In respect of international treaties, they simply agreed to honour the treaty obligations of Czechoslovakia. Something similar can apply when the UK leaves the EU. What happens is that we can rely on a general presumption of continuity that is held to exist by many authorities on international law, as expressed in the basic primers. To help matters along, there is even a formal template that can be followed, in the form of the Vienna Convention on Succession of States in respect of Treaties. And although the UK has not acceded to this Convention, it doesn't really matter. The Czechs and Slovaks basically followed it, even though it was not then in force. The presumption of continuity was sufficient. Nevertheless, the Convention is helpful in that it sets out the procedures for carrying over treaties, where all parties agree to their continuation. It allows a succeeding state – in this case the UK – to establish its status as a party to existing treaties by way of a formal notification of succession lodged with the depository of each treaty. There is one minor snag, in that continued participation in the treaties will normally require the consent of all the parties. It does not seem likely, though, that many parties will want to withhold consent, especially as, in many cases, third countries are beneficiaries of the treaty provisions. A good example is the Mutual Recognition Agreement on Conformity Assessment between the EU and Australia, which allows Australia to export specific goods to EU Member States. In this case, it would be irrational Australia to withhold consent. There may be a further problem as there is a distinction between treaties made jointly between the European Union and its component Member States, and other parties (whether bilateral or multilateral) – the so-called "mixed" treaties, and those concluded only between the European Union and third parties, such as under the Lisbon Treaty Article 207 powers, known as "exclusive" treaties. There is a possibility that the Vienna Convention procedure might not apply to the exclusive EU treaties. In this case, the UK has no direct locus and, on withdrawal from the EU, might have no part in such treaties. But there again, the principles of the Vienna Convention could be deemed to apply, given the political will. In any event, there are currently very few exclusive treaties, with the EU treaty database listing only 17 made under Article 207, of which only three relate to trade, of the 250 trade agreements listed in the database. Renegotiating these would not present any great problems. Even then, there is a further option which would avoid the possibility of being held to ransom by third countries which do not consent to an independent UK as a treaty partner. This would involve an agreement with the EU of a limited treaty giving Britain notional membership status for the strict and exclusive purpose of taking advantage of third country treaty provisions. Any such arrangement would most certainly be of limited duration, and adopted only to give time for selective renegotiation and/or re-enactment with the original parties to the third country treaties. More likely, though, the presumption of continuity will suffice. That makes the claims of the three former ambassadors alarmist at best, but more like yet another dose of lies. Treaty continuity is a minor administrative problem – nothing more. It takes the liars of the BSE campaign to turn it into a crisis.